The pest control industry is an industry that must change and adapt constantly due to things such as the weather, pest adaptation and resistance, introduction of imported/non-native pests, and ever changing laws which protect us and our environment. 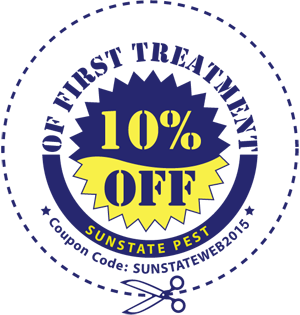 Sunstate Pest Management is your best choice for the control of household pests. We diligently pursue the use of integrated pest management, utilizing new application methods and techniques. These techniques include gels, baits, and dust applied to strategic sites where pests are known to live and breed. We have developed an exterior treatment program to target pests before they enter your home. Should an unwanted pest gain access to your home, we will provide interior treatment at no additional charge. 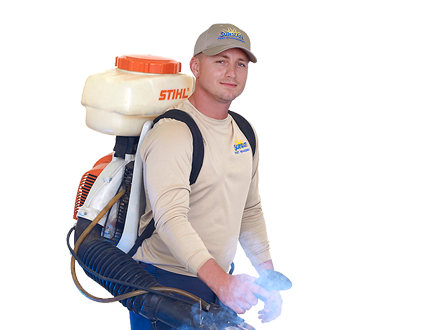 We also offer interior and/or exterior treatment to target pests such as German roaches, ghost ants, pharaoh ants, silverfish, and pantry pests. Services are offered monthly, bi-monthly, quarterly, or annually. One time services are available for specific issues. Allow us to develop a service plan to address your needs and fit your budget. We service Brevard County Florida, Rockledge Florida, Melbourne Florida, Palm Bay Florida, Indialantic Florida, Titusville Florida, Kissimmee Florida and St. Cloud Florida, including Lake Nona and Osceola. Ticks are a blood sucking nuisance that can also carry disease.They are usually brought in by pets and are found in the highest concentration near wooded or grassy areas. These rodents can cause a lot of trouble for a homeowner, renter or business. They burrow in and around your house and can spread disease. You definitely want to keep your space free of these pests. Anyone living in Florida knows what these insects are. They are a parasite that bite and take blood from their host. They are notorious for causing discomfort and even spreading illness. Thank you for sending Nathan to check for "pests" in or on my roof. He was extremely pleasant and I am assured he did a good job. Maybe I can sleep nights, now. Thank you!!! Happy Holidays! Sunstate Pest Management has just recently become my lawn maintenance provider, and I couldn't be more pleased. They have provided the best possible lawn care for my recent Floratam re-sod installation, are available to quickly answer questions, and always follow-up as promised. I would recommend this company without hesitation, and if you ask for Eric, he will be your best "lawn friend" ever. Great company and did the job right, at half the price their competitor wanted (Massey). I highly recommend these guys, plus they're local and independently owned. I like small businesses. Have used personally and also have recommended to many of my friends and family. Everybody that works there, including owner, office staff, GM Eric, and my tech Will. Have all been extremely helpful and polite. They go out of their way to take care of customers. They make you feel like family. Highly recommend! We have used Sunstate for over 15 years for quarterly treatments. Each visit is professional and thorough. On occasion, we have had break through ant problems, a phone call and our regular tech is scheduled for a "problem call" included in cost of quarterly contract. We have been very happy with the service of Sunstate and would recommend them highly.